Surprise! . . . Six days and counting! Our winter update in photos . . . Waiting + almost ready to go in anticipation. C&NW & Caltrain bilevels extras! Extra Extra - Fall Cleaning! Paint and test fitting together our new 77-ft S.P. chair car kit. Wheels of Time Custom Editions Trucks! In production . . .
Lumber load and D&RGW - What do they have in common? Re-introducing our Custom Editions line of vocation trucks! Shipping First Run of N scale PC&F . . .
Revised N-scale Conrail PC&F Ex Post Insulated Boxcars! N-scale two day reservation deadline warning. Western Pacific "Fab Four" . . . a holiday cheer! Wheels of Time N scale SP and UP Harriman baggage cars. Really awesome tutorial . . . Try this out for free! So you want to build a lumber load . . . Speaking of lumber loads . . .
Have a super 4th of July! Announcing Pacific Car & Foundry Ex Post RBL & XLI in N! Photo break for your day! HO-scale 62-ft Gunderson flatcars and look-alike cousins are . . .
Photo break for your day: Even real railroads had problems . . .
Revised production schedule . . .
Lumber Loads by the train loads! Pre-Orders are due. Lumber loads . . .
Load up with HO scale Lumber! For the scratchbuilder . . .
N scale Harriman coaches coming! Finalizing artwork for our Baggage-Horse . . .
53'-6" Welded Construction Fish Belly . . . Photos for a happy Thursday! 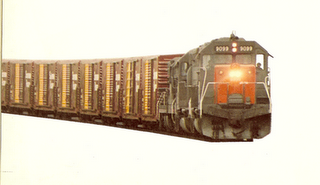 Introducing the 80-ft Horse-Baggage Cars, Baggage-Express cars and Horse-Express Cars in N -scale! Nacionales De Mexico corrected lettering! Project Updates from Wheels of Time! All ready to ship! N scale Crawler tractors! A happy photo break for the day! Details of Wheels of Time HO scale Gunderson . . .
See you at National Train Show Booth 415 @ Portland! 1 more day to enter contest! You might just win! N scale PC&F Insulated Box Cars …photos! The Virtues of our box car . . .
How to handle Stac Pac containers! We are shipping . . .
Ok SF Bay Area steam fans this one is for you. Lumber loads for your lumber trains! Skybox on SP F-70-12 . . .
Rolling West . . .
WP Transport . . .
Canadian Pacific in Action Red and …. Chicago & Northwestern, and Cotton Belt PC-90s! Customers with AOL email address! Please read. A little bit of history from . . .
Tracking real time . . .
More Heavyweight Car for The Dixie Line! Illinois Central in chocolate and orange! Canadien National or Canadian National! Baltimore & Ohio Class B-18 in N-scale! Paint Chips for Northern Pacific Loewy Green! A review from Model Railroad News! Photos of our new HO scale Piggy-Packer! Vote! VOTE for Wheels of Time entry into …. What weighs over 2000 lbs and comes in 4 pallets? Come along and ride this train . . .
For the intermodal fan @ heart . . .
Piggy-Packers . . . photos! A photo diorama intermission . . .
Don't forget. Pre-order for Wheels of Time Motor Coaches are due. N-scale PC&F Insulated box cars are in! New! Motor Coaches for your N Scale communities! Pre-Production Photos of HO scale PC-90 Piggy-Packers! Are U a fan of Wheels of Time? Nothing could be finer . . . Estimated Delivery of our PC&F Insulated Box Cars . . .
New exclusives HO Scale PC-90 Piggy-Packers for CN and BC fans! Revised paint diagrams for HO scale Piggy-Packers! Coming soon ... new insulated boxcar with Superior plug doors in N scale. A photo survey of side loader models! Photos of our new insulated box car! A sea of yellow. . . UP style. People can make a difference . . . well sometimes. How dirt moves (a photo essay). The old shall be really new . . . Preview of something really really cool. Dirt (trash) container trains + Packers = Cool Action! The Best N-Scale Vehicle of the Year Award. A Contest: Union Pacific 150 years timeline but wait . . . Wheels of Time shipping supply in pictures. . .
Piggy-Packer artwork revisions and the competition! New prototype photos of PC-90 Piggy-Packers! National Train Show in Sacramento! Starting to ship . . .
Old--Really Old--Landmark. Perfect modeler's project! See us in N Scale Magazine - Hint! MOW Series Plus More! Latest. I live and work within earshot of the former SP Coast Line Peninsula Line which is now Caltrain. Here is a view of their CEMOF. Enjoy. Welcome to Wheels of Time. This is the place to see a snap shot of our current projects and a quick preview of what's coming up plus more! Be sure to subscribe to our Wheels of Time newsletter too.